The Role of Oxytocin in Social Buffering: What Do Primate Studies Add? The ability to maintain close social bonds impacts on reproductive success, longevity, stress and health in social mammals, including humans (Silk et al., Curr Biol 20(15):1359–1361, 2010; Crockford et al., Horm Behav 53(1):254–265, 2008; Wittig et al., Horm Behav 54(1):170–177, 2008; Archie et al., Proc R Soc B 281(1793):20141261, 2014; Cameron et al., Proc Natl Acad Sci U S A 106:13850–13853, 2009; Schülke et al., Curr Biol 20:2207–2210, 2010; Silk et al., Science 302:1231–1234, 2003; Holt-Lunstad et al., PLoS Med 7(7):e1000316, 2010). Close social bonds provide an important social support system, at least in part by acting as a buffer against the deleterious effects of chronic exposure to stressors (Young et al., Proc Natl Acad Sci U S A 51:18195–18200, 2014; Heinrichs et al., Biol Psychiatry 54:1389–1398, 2003). There is accumulating evidence that individuals that provide predictable affiliation or support to others (bond partners) may moderate the perception of the stressor as well as of the physiological stress response. The neuropeptide, oxytocin, may mediate social buffering by down-regulating HPA activity and thus reducing the stress response. 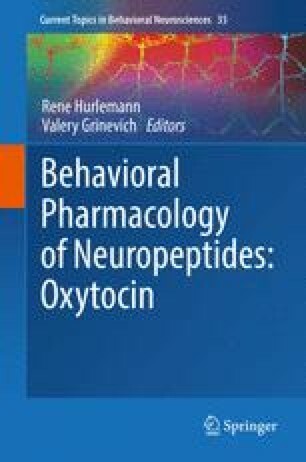 However, much within this process remains unclear, such as whether oxytocin is always released when exposed to a stressor, whether more oxytocin is released if there is social support, what aspect of stress or social support triggers oxytocin release and whether social support in the absence of a stressor also impacts oxytocin release and HPA activity, during everyday life. We review the literature that addresses each of these questions in an attempt to clarify where future research effort will be helpful. A better understanding of these dynamics is likely to have implications for enhancing social and health gains from human social relationships. Funding was provided by the European Union’s Horizon 2020 research and innovation programme under grant agreement No. 679787 and the Max Planck Society.